SPCookieQueen: A one pot meal is always a good thing in my book. A one pot meal is always a good thing in my book. Things have been shaping up nicely around here and my parents' 50th wedding anniversary party preparations are in full swing. I still have the cake and a few last minute things to handle, but I'm started to see the light at the end of the tunnel. I really enjoyed working on all the decorations, especially the cake stand; a tire rim in honor of my dad the car guy. I have to keep all the party talk hush-hush around my dad because he was scoffing about us not doing too much. As if I would do such a thing, crazy talk I tell you. Between work, trying to get in some exercise, and working on the party decorations I haven't had much time for anything else, especially cooking complicated meals. Several nights last week I was lucky if I had a hot meal at all. So tonight I went with a perennial favorite; the one pot meal. This was so quick and easy to make it actually left me with a few minutes left to write the recipe down. In a large deep-sided skillet add the olive oil, onion, carrots, and celery and cook on medium heat for a few minutes until the veggies are starting to become translucent. Add the garlic and stir for a few minutes. Add the cumin and stir. Push the veggies to the sides of the pan and add the pork chops. Salt and pepper the chops and add more salt and pepper to the pan. Add the rice to the sides of the chops. Place the tomatoes and bok choy on top of the rice and pork chops, cover the whole thing with vegetable stock. Bring to a boil and then turn heat down to medium and cook with the lid on for 25-30 minutes, until the rice is tender. You could easily sub out chicken or whatever protein you'd like. I like how spicy the cumin makes the rice, if you don't like spice at all; sub in some Italian seasoning. How lucky are your parents!? 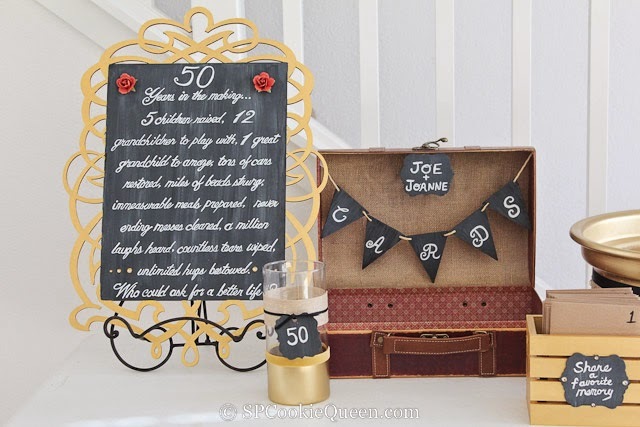 50 years, and an amazing daughter who plans a lovely celebration! The cake stand may be my favorite, Gina. That is so ingenious. 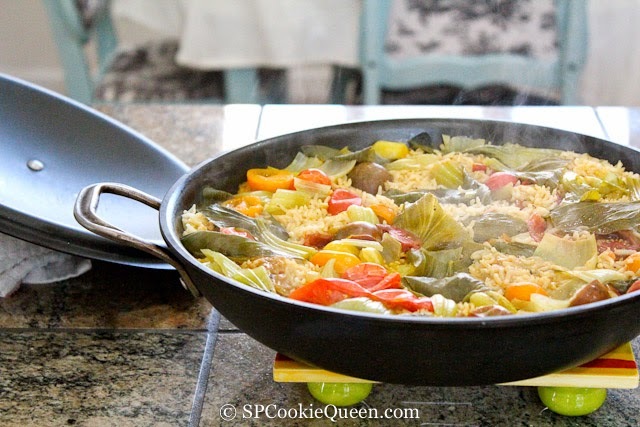 Hope you get more hot meals this week, this one pot dish is perfect in my book. You really have been busy and I can see that all the effort is worth it for you as you celebrate your parents! Happy 50th to your mom and dad. It's sweet that your dad doesn't want you to over-do! I'm sure they will love every minute and every detail, not to mention the lasting memories to cherish! I love one pot meals! I just finished a dish of basmati rice with vegi's....I knew I was missing something...pork chops and bok choy! ;) Yours looks delicious! 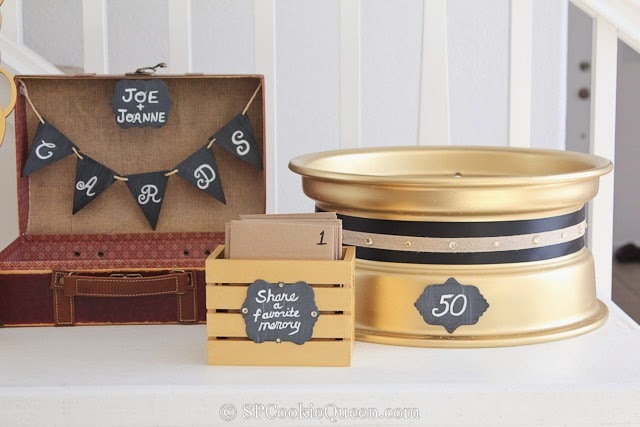 Your 50th wedding party details are spectacular, especially the tire rim for the cake stand. You are so creative. I'm sure that your parents will love them. I love all of the colors in your one pot meal, which fills the bill on busy days,,w ith little time to cook. you have crafted every detail to perfection with your creativity and talents, I just love watching you work!!!! Everything is spectacular, and this one pot meal is something I'm going to have to try, looks fantastic...thank you for sharing your world with us....love you to pieces! One pot meals always work for me -- usually easy to put together, and always tasty. This looks terrific! Happy 50th to your mom & dad -- such a big deal. The one pot meal is always a winner and your dinner is looking pretty good! And delicious looking one pot meal! Wow! Loved seeing more of the big celebration! You are doing such a great job! And I am ALWAYS about a one pot meal. Thank you for sharing this one! You are so talented, Gina. I wish I was one tenth good as you at crafting. I am going to make one pot chilli for the dinner today too. Yes, this is my kind of meal...one pot! Looks delicious Gina, you have it all rice, veggies and meat...whatelse could I ask for? Happy 50th anniversary to your parents. They have a great daughter, you are so thoughtful. Your one pot meals is my type easy and quick. Your decorations are beautiful, your parents are in for a treat and I love this easy and flavorful one pot meal! I'm sure your anniversary party was a smashing success. And I'm always happy to add another easy dinner to my repertoire! Thanks!